Increasing Europe’s resilience to crises and disasters is a topic of highest political concern in the EU and its Member States and Associated Countries. Regarding the specific case of transport systems, it can be said that those have developed a prominent safety and business critical nature, in view of which current management practices have shown evidence of important limitations in terms of resilience management. Furthermore, enhancing resilience in transport systems is considered imperative for two main reasons: such systems provide critical support to every socio-economic activity and are currently themselves one of the most important economic sectors and secondly, the paths that convey people, goods and information, are the same through which risks are propagated. RESOLUTE is based on the vision of achieving higher sustainability of operations in European UTS. The project recognises foremost the ongoing profound transformation of urban environments in view of ecological, human and overall safety and security needs, as well as the growing importance of mobility within every human activity. Sustainability is rapidly becoming an imperative need across all economic and social domains. Among many things, this requires overall heightened operational efficiency, mainly by optimising the allocation and utilisation of available resources (organisational technical and human), whilst striving to continuously minimise any source of waste, namely incidents, accidents and other operational failures. Within this context, RESOLUTE considers resilience as a useful management paradigm, within which adaptability capacities are considered paramount. Rather than targeting continuous economic and financial growth of businesses and market shares, organisations must generate the ability to continuously adjust to ever-changing operational environments. RESOLUTE is answering those needs, by proposing to conduct a systematic review and assessment of the state of the art of the resilience assessment and management concepts, as a basis for the deployment of an European Resilience Management Guide (ERMG), taking into account that resilience is not about the performance of individual system elements but rather the emerging behaviour associated to intra and inter system interactions. 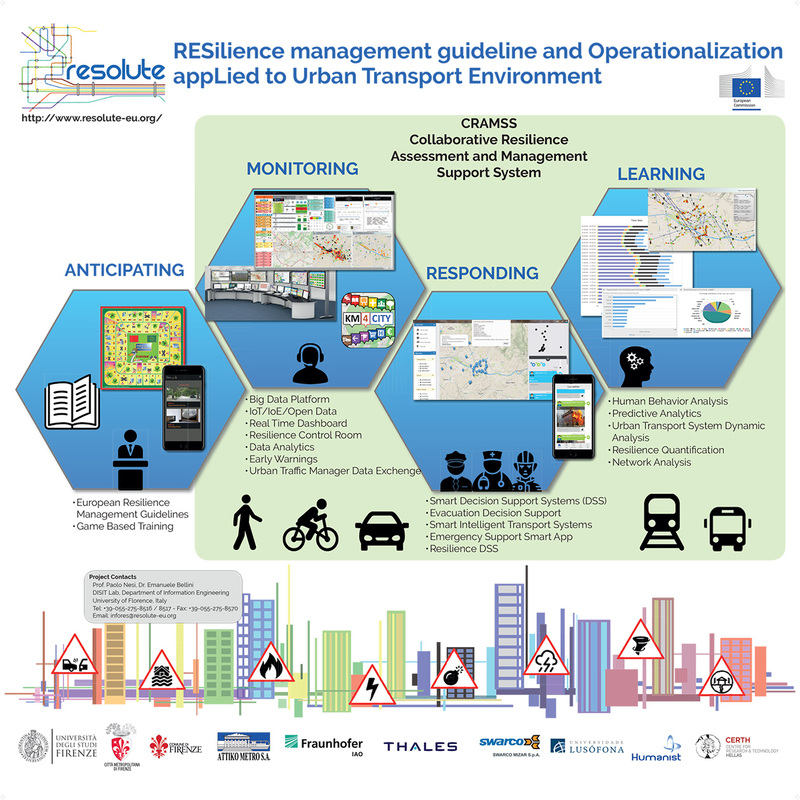 The final goal of RESOLUTE is to adapt and adopt the identified concepts and methods from the defined guidelines for their operationalization and evaluation when addressing Critical Infrastructure (CI) of the Urban Transport System (UTS), through the implementation of the RESOLUTE Collaborative Resilience Assessment and Management Support System (CRAMSS), that adopts a highly synergic approach towards the definition of a resilience model for the next-generation of collaborative emergency services and decision making process. Please, insert your name and a valid email to receive our newsletter. The event "Resilience in Cities: Solutions, Organization Models and Collaboration" took place in Florence the 24th of April, 2018. DARWIN, IMPROVER, RESILENS, RESOLUTE, and SMR projects organise their joint final event on Critical Infrastructure Resilience 2018. More info here. © 2015 - 2018 RESOLUTE consortium | The RESOLUTE project received funding from the European Union Horizon 2020 programme under Grant Agreement n°653460.